Headaches involve pain in the head or facial regions and can be caused by a number of factors including: nerve pain, blood vessel constriction/dilation, muscle tension and brain trauma. In many cases the true cause of the head pain is unclear. The brain itself does not have pain receptors therefore it cannot be a source of pain. However structures around the brain including nerves, meninges, and dura can be a source of head pain. The muscles of the face and neck can also cause local or referred head pain/headaches. Headaches may be classified as primary or secondary. A primary headache is a headache that is due to the condition itself while a secondary headache is due to another condition (i.e. : a sinus headache from sinusitis). A migraine headache is classified as a primary headache disorder. You must have a minimum of 5 headaches to be diagnosed with migraine headaches. Chronic migraines occur on 15 or more days per month for more than 3 months in a row. Visual: zigzags, flashes of light, a blind spot, partial or total blindness. Motor: weakness in the limbs, trouble speaking. Brainstem: trouble swallowing, vertigo, ringing in the ears, double vision, trouble with balance, decreased level of consciousness. Patients often find it difficult to describe their aura symptoms. One or more aura symptoms may spread gradually over 5 minutes or 2 or more occur one after the other. Each aura symptom lasts between 5-60 minutes. The aura is typically followed by a headache within 60 minutes. 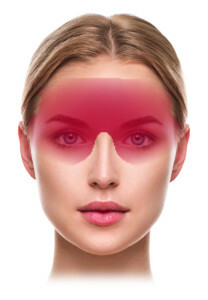 Visual aura is the most common type of aura occurring in +90% of migraine patients that have aura. Pins and needles moving slowly from one point, which affects one side of the body, face or tongue. Many people who have migraine with aura may also have migraines without aura. Premonitory symptoms may begin hours or a day or two before the other symptoms of a migraine which include: neck stiffness, sensitivity to light and or sound, nausea, blurred vision, yawning. These are not considered to be part of the aura symptoms. Cerebral blood flow has been shown to decrease in the cortex (outer portion of the brain) before or with onset of aura. Blood flow reduction usually starts at the back and then spreads to the front over several hours. Migraine headaches with the symptoms described above (pain on one side of the face, head, nausea, vomiting, sensitivity to light and or sounds etc.) without aura. Imbalance in brain chemicals – including serotonin which helps regulate pain in the nervous system. Sensory stimuli (bright lights, sun glare, loud sounds, strong smells like perfume, pain thinner and smoke). Migraine headaches should be diagnosed by a primary medical provider (i.e. : chiropractor, physiotherapist & or medical doctor) based on a thorough history and physical examination. Headache diaries in which symptoms are recorded daily are important to help diagnose migraine headaches and can also be used for treatment purposes. Headache diaries are required to record information regarding pain and associated symptoms day to day for at least 1 month. Create a consistent daily schedule/routine with regular sleep patterns and regular meals. Control stress through meditation, mindfulness, self-care, and gentle exercise. Reduce the effects of estrogen by reducing medications that contain estrogen (if possible). Exercise regularly: regular exercise reduces tension and can help prevent migraines. Warm up slowly because sudden intense exercise can trigger migraines. Complete a headache diary to determine common triggers and avoid these triggers when possible. Regular treatment for joint and muscle dysfunction from a chiropractor. Onset builds up over the course of the day with stress or tension. No warning signs such as aura will come before the headache. Pain on both sides of the head, and or face. Described as dull and achy, a tight band or heavy weight on the head, pressing or tightening. Pain does not worsen with physical activity. Headaches are not typically associated with nausea. Sensitivity to light or sound may be present. Tenderness to muscles around the head and face. The exact mechanisms of tension-type headaches are not known. The source of headaches may be related to decreased blood flow to the outer part of the brain, which can occur secondary to muscle contraction/muscle tension. Muscle contraction can also cause irritation of the nerves that travel up the back of the head. The greater occipital nerve pierces the trapezius or between the trapezius and the semispinalis muscle to reach the occipital area. 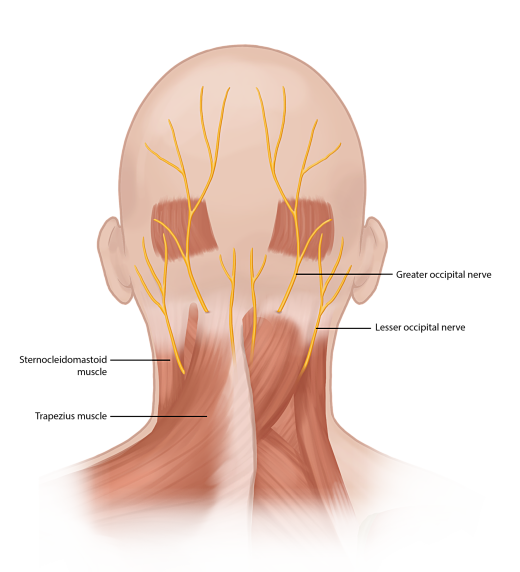 The lesser occipital nerve travels along the sternocleidomastoid muscle at the side of the neck and travels to the scalp. Muscle tension in any of these muscles can compress the nerves and result in nerve irritation and head pain. Tension-type headaches can also be secondary headaches, which means they are secondary to other conditions such as overuse of medications. Cervicogenic headaches are also known as occipital neuralgia. Neuralgia is a word used to describe pain generated by injury to a nerve. In cervicogenic headaches the nerve affected is located in the head or facial region. Clinically this nerve irritation presents as pain in the back of the head/neck that may refer into the temples or behind the eye. The greater occipital nerve runs behind the skull from the back of the neck to the top of the head. 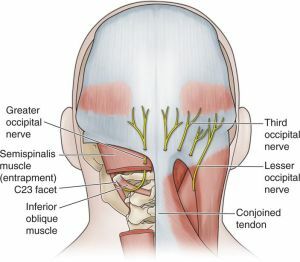 It also curves around the upper cervical facet joints C2-C3 and through the suboccipital muscles at the back of the neck (which connect to the skull). May occur daily or at least 2-3x/week. Slow increase in symptoms throughout the day. Symptoms are typically on one side of the head, neck or face. Symptoms typically start at the suboccipital region – connection between back of neck and head. Symptoms may progress and radiate into the temples, forehead or behind the eye. Symptoms described as a dull ache or boring pain. May occur with: nausea, blurred vision, difficulty swallowing, or sensitivity to light/sound. Cluster headaches involve excruciating pain in bouts of 15 minutes to three hours. To be diagnosed with cluster headaches you must have at least 5 attacks to be classified as cluster headaches. The cause of cluster headaches is unknown but has been suggested that it involves abnormalities of the hypothalamus. The hypothalamus is a part of the brain that has various functions. It is responsible for the regulation of various aspects of the metabolism, of the autonomic nervous system, hormone release, sleep, hunger, body temperature and more. 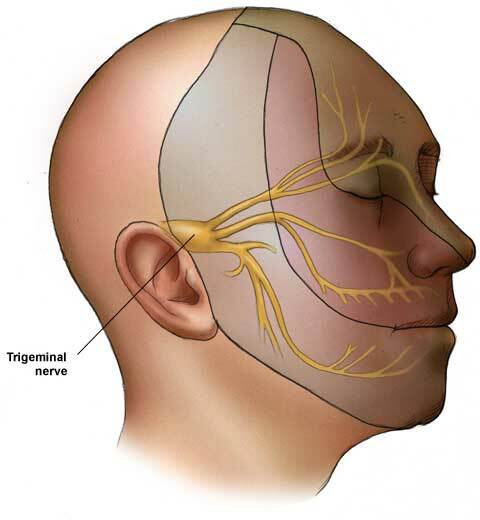 It is also believed that dilation of the blood vessels creates pressure on the trigeminal nerve. There is no familial history associated with cluster headaches, unlike migraine & tension type headaches. Medications are the main treatment for cluster headaches. When headaches occur increasing oxygen to the brain will often help to decrease the length of symptoms so exercise, oxygen treatment, caffeine, hot showers have also been used with varying results. The first step for successful treatment of any type of headache involves a correct diagnosis. Book in to see a chiropractor at Mountain Health & Performance to have your headache properly assessed and diagnosed. A specific plan of management will be created to treat the headache as well as the associated joint and soft-tissue dysfunction that may be contributing to your headaches. Migraine headaches can be treated by various medications that have been specifically designed to prevent or treat migraines. It’s important to discuss your migraine symptoms with your medical doctor to determine if preventative medication and or pain medication during migraine attacks is appropriate for you. In addition to medication several manual therapies have shown promise for the treatment of migraine headaches. Current randomized control trial studies have shown that spinal manipulation and mobilization is effective in reducing the frequency of migraine headaches. Spinal manipulation affects the nervous system and helps to decrease pain and nerve irritation. It can also help to improve mobility and reduce muscle tension in the neck, which may be contributing to or worsening migraine headaches. A Cochrane review determined that manipulation of the spine may be effective for migraine and tension headache and that manipulation combined with neck exercises may be effective for cerivcogenic headaches. A systematic review by Vernon concluded that for headaches that are tension type or cervicogenic, spinal manipulation is an effective treatment for the reduction of symptoms. Rehabilitation has proved effective at reducing the frequency of cervicogenic headaches. The chiropractors at Mountain Health & Performance can provide correct postural strengthening exercises and stretches to help strengthen the neck and back and reduce tension in the surrounding musculature.